From 20 to 27 February, Rao Quan, Director of the National Library of China (NLC), accepted the invitation from National Library Board Singapore (NLB) and National Library of New Zealand (NLNZ), headed a 5-person delegation to Singapore and New Zealand. Mao Yajun, Director of Coordination & Operation Management Division, Zhang Xu, Director of International Cooperation Division, Cao Ning, Director of Digital Resource & Service Department and Hao Jinmin, Associate Research Librarian from the International Cooperation Division were in the NLC delegation. 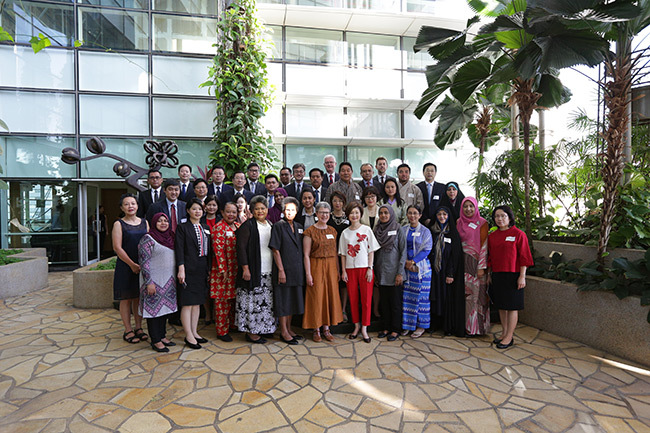 During the visit to Singapore, the delegation attended the second Forum of Silk Road International Library Alliance co-hosted by the NLC and the NLB. Rao Quan made the keynote report named On Construction and Prospects for the Future of the Silk Road International Library Alliance, which put forward five priority areas for the cooperation among members of the Alliance, and clarified the future direction of the Forum. Representatives from member libraries presented statements actively and discussed jointly, further rationalized the Alliance mechanisms including coordination, communication, application and organization, provided strong protection for the sustainable development of the Alliance. All the member libraries agreed by consensus that the next Forum would hold in Jakarta, Indonesia. Before that, the delegation attended the 27th Conference of Directors of National Libraries in Asia and Oceania; on behalf of the NLC, Mao Yajun made the report named Inherit & Innovation: The Long-Term Development Plan of the National Library of China. In addition, the delegation also visited Singapore China Cultural Center; Rao Quan had an in-depth discussion on how the Center further played its role with Xiao Jianghua, Director of the Center. During the visit to New Zealand, the delegation visited the NLNZ and its branch in Auckland. On behalf of the NLC, Rao Quan co-renewed Arrangement on Cooperation between the National Library of China and the National Library of New Zealand with William Macnaught, Director of the NLNZ. 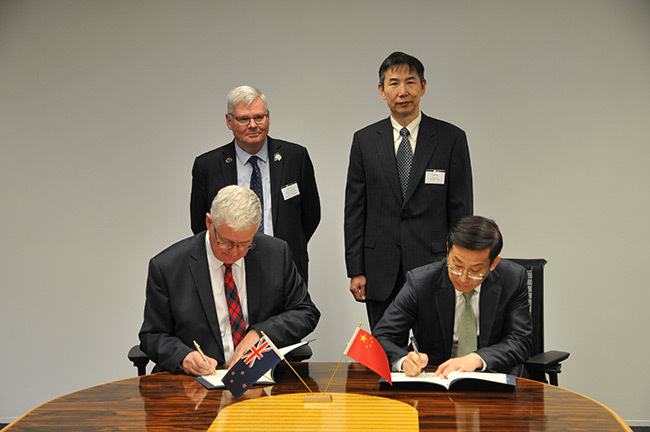 Peter Murray, Deputy Chief Executive of Ministry of Internal Affairs of New Zealand, Chen Yue, Counsellor of Education in Embassy of the PRC in Wellington and Brian Hewson from North Asia Division of Ministry of Foreign Affairs and Trade of New Zealand witnessed the ceremony. Furthermore, Wu Xi, Ambassador of the PRC to New Zealand, met with the delegation, she exchanged views with Rao Quan on how to promote cultural exchange and collaboration between China and New Zealand and other issues.